Holiday shoppers have been careful each holiday season to make their lists and check them twice. Budgets have become more discerning, and savers have become better planners for their holiday spending, prioritizing savings along the way. According to a September 2016 report, two out of five millennial shoppers got a head start this year and had started buying gifts for the season before summer had even come to a close. These successful financial habits don’t have to stop there. With the New Year comes an opportunity to make some improvements to your financial health. Don’t make just another resolution that disappears by Valentine’s Day. Take your financial wellness to a whole new level: a New Year, a new financial you. 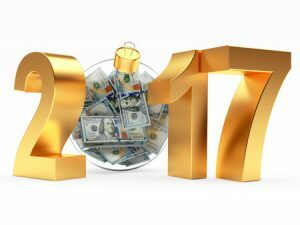 These five steps will help you to establish your best financial path for 2017, and you can have all the heavy lifting done before the clock strikes twelve. Take stock of your finances. Take account of all your income, expenses, and existing savings/investment accounts. And no matter how nice you were, don’t forget to include any naughty debts you may have incurred in the spirit of the season. Sketch out a budget “template” for the year to come. Think big picture. Plan your holiday spending for 2016 with this handy worksheet from Military Saves and find the method for budgeting that you’re going to use in 2017, and rough out what you’d like it to look like from month to month. Be pragmatic about your needs and be honest about where your money is going in. Plan to make adjustments and really dig into your spending habits when you check back in on a regular basis. Check your credit report. It is your legal right to get a free copy of your credit report every 12 months from each of the three major credit reporting bureaus. Add a visit to AnnualCreditReport.com to the calendar as an annual “holiday” or divvy up the bureaus to get a free report from a different bureau every four months. Set up bank and credit alerts, and financial reminders. Whether you’re at your computer or on your mobile device, you are in an ideal position to receive notifications about upcoming payments, suspicious activities on an account, transactions over a certain dollar amount, low balances, and more. Find out what online services your financial institution(s) offer, and supplement what they don’t with an app or calendar reminder. It’s all right there at your fingertips. Make a commitment to yourself to save. Those who make a commitment to themselves and their family to save usually save more than those who don’t. Think of this as your New Year’s Resolution. Make your commitment today by taking the Military Saves Pledge and follow the prompts to sign up for text message tips and reminders. Get regular advice and support from Military Saves to help you save money! A new financial you is an achievable goal for 2017. Join those savers who have successfully opted to reduce holiday spending and prioritize savings throughout the season. To learn more about spending and saving during the holidays and take the Military Saves pledge, visit MilitarySaves.org. Tammy G. Bruzon works for Military/America Saves, managed by the nonprofit Consumer Federation of America (CFA), which seeks to motivate, encourage, and support low- to moderate-income households to save money, reduce debt, and build wealth. Learn more at militarysaves.org.